Mount Hakodate (函館山) is a mountain in Hakodate, Hokkaido famous for the specatular views from the mountain. Mount Hakodate is a 334 meter high, wooded mountain with a nine kilometer circumference at the southern end of the peninsula on which much of central Hakodate is located. 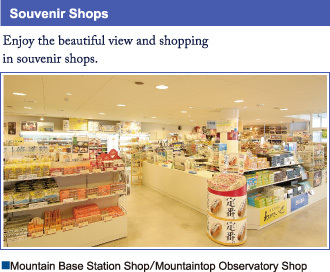 Its location allows an unobstructed view of both the city and the Tsugaru Strait. 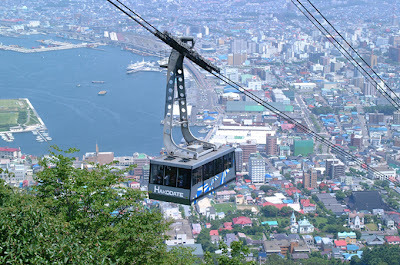 Using Mt Hakodate Ropeway (a kind of Gondola) with 125 persons, passenger can view a beautiful Hakodate port and the city streets of Hakodate to Tsugaru Strait an Shimokita Peninsula. When the weather is fine, you can see the Onuma Park and Mt. Komagatake, as well as the Shimokita Peninsula in Aomori Prefecture in the distance. 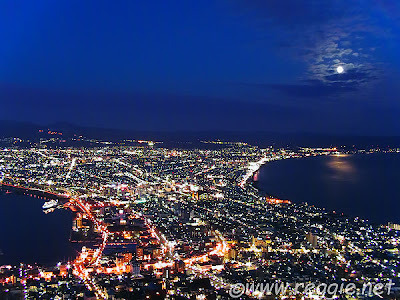 Mount Hakodate nighlife view is also among the best night views in Japan, together with Nagasaki's Mount Inasa and Kobe's Mount Rokko. Since 1964, Mount Hakodate has been assigned National Reservation for Birds and Animals; there are about 600 species of plants, and about 150 species of animals reside in Mount Hakodate. Also there are the memorial monuments of a zoologist Thomas W. Blakiston, who discovered a distribution limit of Japanese animals in Tsugaru Strait, and a topologist Tadataka Inoh, who published the first surveyed map of Japan. 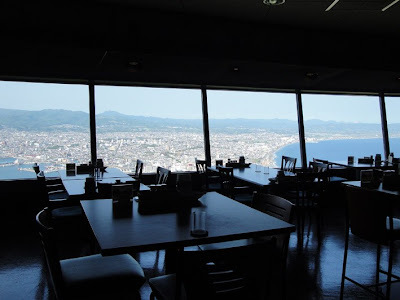 There are souvenir shops, a restaurant with the finest view, and an events hall where 12 monitors produce a multi-vision presentation that introduces the four seasons of Hakodate. The ropeway to the peak of the mountain departs from the Motomachi District, a 5 minute tram ride from JR Hakodate Station. Alternatively there is a direct bus from the station to the peak during the warm seasons of the year. There is also a hiking course to the top that takes about an hour. The cable car station is about ten minutes walk from "Jujigai" streetcar stop. The Mt. Hakodate Ropeway station is situated near the top of the Nanbuzaka-slope; the Nanbuzaka-slope lies next to the city hall branch office of Suehiro-cho (old Marui-Imai department store). The cable car, which rides 125 people, departs every five minutes in rush time. The Hakodateyama Ropeway departs from the Motomachi District. 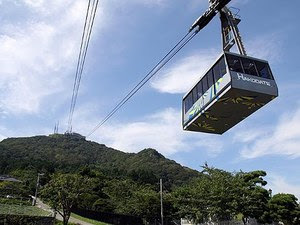 The ropeway's lower station can be reached in a 10 minute walk from the "Jujigai" tram stop (3rd station, 5 minutes, 200 Yen from Hakodate Station) or by direct Hakodate Bus from Hakodate Station (10 minutes, 230 Yen, every 30 minutes in the evening only). 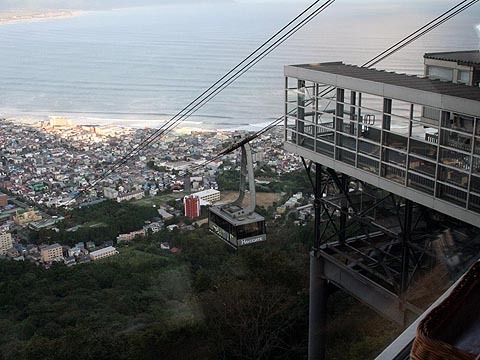 The cost for a ropeway ticket is 1160 Yen for a round trip and 640 Yen for a one way trip. The ropeway operates from 10am to 10pm (until 9pm during winter, from 9am during the Golden Week and summer holidays). From late April to mid November, direct buses by Hakodate Bus operate between Hakodate Station and the summit of Mount Hakodate every evening, taking 30 minutes and costing 360 Yen for the one way journey. Day passes are valid on this bus. There are departures every 20 minutes. Fewer departures in autumn. There is a toll free road to the summit of Mount Hakodate. However, the road gets closed to individual car traffic in the evenings between 17:00 and 22:00 from late April to mid October. 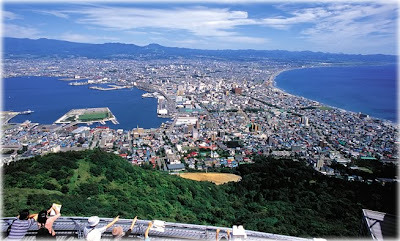 From the top of Mt Hakodate you can see a dreamlike world unlike any other place in the world. The views are spectacular and it is the most comfortable observatory restaurant you'll find at the 2nd floor of the building named "Genova".